OKI is widely known for its productive and innovative machines, but this time it surpassed itself. The company launched a new C900 series of color LED printers C911dn, C931dn, C941dn with revolutionary capabilities. 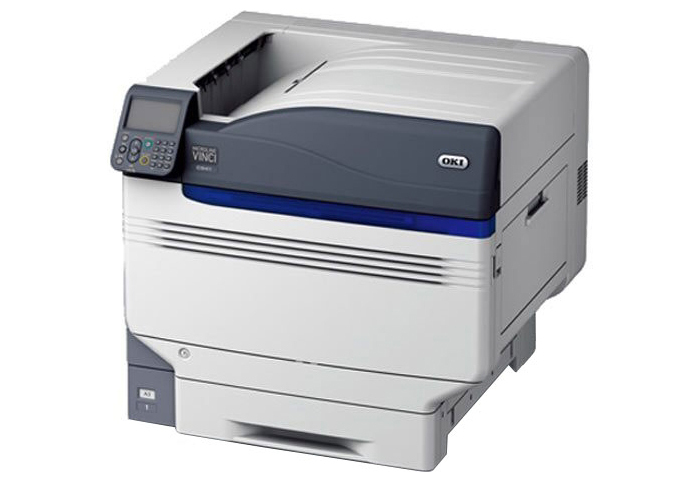 C941dn — a flagship A3 model — is made for office applications. Its unique feature—printing with the use of 5 colors of toner: CMYK plus white or clear—greatly enhances creative capabilities and image quality of the output. It can print on a broadest types of media from 360 g/m extra-thick card stock to 14 mil polyester and magnetic media and it can handle different sizes of media from 3×5-inch index cards to 13×52-inch banners. The use of clear toner allows to produce unusual visual effects. When spot clear toner is put over CMYK, a brilliant effect is achieved. With the white toner it’s easy to print on dark-colored media with an excellent result. The model has improved abilities of printing on gloss and matte media. Fiery® XF RIP server (optional) helps to improve image management. The impressive print speed of up to 50 ppm (both in color and monochrome modes), image resolution of 1200×1200 dpi, monthly duty cycle of 300,000 pages and highest capacity consumables in its class (up to 38,000 pages, based on ISO) makes OKI C941dn a very attractive purchase, while its total cost of ownership is the lowest, compared with the devices of the competing brands. This entry was posted on Thursday, January 23rd, 2014 at 8:08 pm	and is filed under laser, OKI, printer.